Dear children, I love you as you are and I ask you to be faithful to My Son Jesus. You are important to the Lord and He expects a lot from you. Give the best of you in the mission that has been entrusted to you, because only then can you be instruments of love and peace for all your brothers. Flee from sin and serve the Lord with joy. Dedicate part of your time to prayer. Do not allow the things of the world to occupy space in your lives. Seek strength in the Words of My Jesus and in the Eucharist. You live in the time of tribulations and only by the strength of prayer can you achieve victory. Do not cross your arms. God is in a hurry. You walk towards a future of great spiritual confusion. Many consecrated people will embrace what is false and many faithful will be full of doubts. I suffer for what is coming for you. Love and defend the truth. Whatever happens, stay with Jesus. Courage. Whoever is with the Lord will never experience the weight of defeat. This is the message that I transmit to you today in the name of the Most Holy Trinity. Thank you for permitting me to reunite you here once more. I bless you, in the name of the Father, of the Son and the Holy Spirit. Amen. Stay in peace. Dear children, difficult times will come for those who love and defend the truth. Bend your knees in prayer. Love and defend the truth. Value the Presence of My Jesus in your midst. Seek it in the Eucharist and listen with docility to His Gospel. The day will come when you will look for the Precious Food and you will not find it. It will be a time of great persecution to the Church of My Jesus. Perverse men will act in ambush to destroy the Sacred and the pain will be great for the faithful. Many will deny the Presence of My Jesus in the Eucharist and, accepting false doctrines, will say that the Presence of Jesus is only symbolic. The confusion will spread and many will lose faith. I suffer for what is coming for you. Trust in the power of God. He will never leave you. He will bring forth a great man of faith and love of the truth who will defend the Church and His True Doctrine. After all the pain, victory will come. Go forward without fear. Stay on the path that I pointed out to you. Whoever is with the Lord will never experience the weight of defeat. I came from Heaven to take you to Heaven. Listen to me. This is the message that I transmit to you today in the name of the Most Holy Trinity. Thank you for permitting me to reunite you here once more. I bless you, in the name of the Father, of the Son and the Holy Spirit. Amen. Stay in peace. Dear children, do not fear. My Jesus is with you. Trust in Him and everything will end well for you. You walk towards a painful future and great spiritual confusion. Bend your knees in prayer. When you are separated, you become the target of the enemy of God. Move forward with Jesus and in prayer towards the Great Battle. The victory will be of the Lord and His chosen ones. Let yourselves be led by the hands of the Lord and do not allow the things of the world to contaminate you. Encourage and be men and women of faith. Do not retreat. I love you and I will pray to My Jesus for you. Witness the wonders of the Lord with your own life. The silence of the righteous strengthens the enemies of God. Courage. This is the message that I transmit to you today in the name of the Most Holy Trinity. Thank you for permitting me to reunite you here once more. I bless you, in the name of the Father, of the Son and the Holy Spirit. Amen. Stay in peace. Dear children, you are the Belonging of the Lord and Him alone must you follow and serve. Open your hearts to the Lord and let Him transform you. Do not allow the things of the world to contaminate you and separate you from the Path of Salvation. Be docile and accept the Will of God for your lives. I know each of you by name and I will pray to My Jesus for you. You live in a time worse than in the time of the Flood and it is the moment of your return. Do not cross your arms. God is in a hurry. What you have to do, do not leave for tomorrow. Believe firmly in the power of God. He is in control of everything. Do not lose your hope. Get away from all evil and return to Him who is your only and true Savior. Do not forget: in your hands the Holy Rosary and the Sacred Scriptures; In the heart, the love of the truth. Mankind turned away from God because men turned away from prayer. Take care of your spiritual life. Courage. Nothing is lost. When you feel weak, seek strength in the Eucharist. Your victory is in the Lord. You walk towards a future of great persecution. Men and women of faith will drink the bitter cup of pain for loving and defending the truth. The great persecution will also come for your Brazil. What I announced to you in the past will come. I suffer for what is coming for you. Give me your hands and I will lead you on a safe path. Go forward without fear. This is the message that I transmit to you today in the name of the Most Holy Trinity. Thank you for permitting me to reunite you here once more. I bless you, in the name of the Father, of the Son and the Holy Spirit. Amen. Stay in peace. Dear children, be honest in your acts. You are in the world, but you are not of the world. I ask you to keep the flame of your faith burning. You are important to the Lord and He expects a lot from you. Flee from sin and serve the Lord with joy. You live in the time of pain, but do not retreat. The Lord is very close to you. When you feel the weight of the cross, call for Jesus. He is your all and only in Him is your true liberation and salvation. Give me your hands and I will lead you on the path of good and holiness. Repent with sincerity and approach the confessional to receive the mercy of My Jesus. When you feel weak, seek strength in the Eucharist. Courage. You will still see horrors on Earth, but after all tribulation, the Lord will wipe away your tears and you will be victorious. Go forward in the defense of the truth. This is the message that I transmit to you today in the name of the Most Holy Trinity. Thank you for permitting me to reunite you here once more. I bless you, in the name of the Father, of the Son and the Holy Spirit. Amen. Stay in peace. Dear children, embrace the truth contained in the Sacred Scriptures, because in it is the Will of God for your lives. Perverse men will act to confuse men and women of faith. Stay attentive. Do not allow anyone to distance you from the truth. I ask you to live My Appeals and that everywhere you try to witness that you belong to the Lord. Dedicate part of your time to prayer and listening to the Words of My Jesus. Get away from the world and live turned towards the Paradise for which you were only created. I love you as you are and I came from Heaven to take you to Heaven. Courage. Do not forget: In all, God in the first place. This is the message that I transmit to you today in the name of the Most Holy Trinity. Thank you for permitting me to reunite you here once more. I bless you, in the name of the Father, of the Son and the Holy Spirit. Amen. Stay in peace. Dear children, the day will come when many who are zealous in the faith will retreat, because they will be afraid to bear witness to the faith because of the great persecution there will be. I am your Sorrowful Mother and I suffer for what comes for you. Bend your knees in prayer and seek strength in the Words of My Jesus and in the Eucharist. The brightness of the truth will be extinguished in many places and that which is false will be embraced. Here are the most painful times for the righteous. Courage. Do not turn away from the truth. Whatever happens, stay with Jesus and with the true Magisterium of His Church. This is the message that I transmit to you today in the name of the Most Holy Trinity. Thank you for permitting me to reunite you here once more. I bless you, in the name of the Father, of the Son and the Holy Spirit. Amen. Stay in peace. Dear children, God has sent me to you to tell you that this is the opportune time for your return. Do not cross your arms. What you have to do, do not leave for tomorrow. 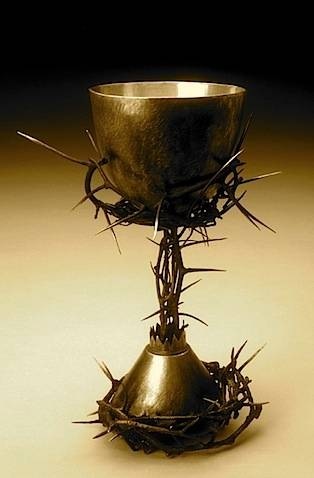 Mankind will drink the bitter cup of suffering because men turned away from the Creator. Pray much before the cross and pray for God's mercy for your lives. I suffer for what is coming for you. Seek strength in the Gospel and in the Eucharist. When everything seems lost to you, the victory of God will come to the righteous. Do not retreat. I am your Mother and I love you. Courage. This is the message that I transmit to you today in the name of the Most Holy Trinity. Thank you for permitting me to reunite you here once more. I bless you, in the name of the Father, of the Son and the Holy Spirit. Amen. Stay in peace. Dear children, you are the Belonging of the Lord. Give Him your own existence. Do not allow your freedom to prevent you from feeling the Presence of the Lord and His inspirations for your lives. Be docile. The Lord needs men and women of courage. Witness everywhere the Gospel of My Jesus. Show everyone, with your examples and words, that you are in the world, but you are not of the world. You live in the time of the Great Tribulation, but the worst will come. Stay tuned. Love and defend the truth. Do not cross your arms. I am your Sorrowful Mother and I suffer because of your sufferings. The Great Vessel will lose its course leading to the Safe Harbor and many will get lost. It will be a time of great pain for those who love the truth. Bend your knees in prayer. Only by the strength of prayer can you defeat the devil. Go forward without fear. This is the message that I transmit to you today in the name of the Most Holy Trinity. Thank you for permitting me to reunite you here once more. I bless you, in the name of the Father, of the Son and the Holy Spirit. Amen. Stay in peace. Dear children, do not forget: In all, God in the first place. Do not allow the things of the world to occupy space in your lives. You are the Lord's and He expects a lot from you. You are going towards a great spiritual war. Your weapon of defense is the truth of My Jesus. Love and defend the truth and no evil will reach you. The seed of evil will spread and will cause great harm to many souls. Stay with Jesus. Love and defend the truth. Bend your knees in prayer and you will be rich in faith. I am your Mother and I came from Heaven to point you to the path to true liberation and salvation. Go forward without fear. This is the message that I transmit to you today in the name of the Most Holy Trinity. Thank you for permitting me to reunite you here once more. I bless you, in the name of the Father, of the Son and the Holy Spirit. Amen. Stay in peace. Dear children, suffering will come for you, but the Lord will wipe away your tears. Whatever happens, do not lose your trust in the Lord. He loves you and is always close to you. Trust Him who is your Absolute Good and knows you by name. You walk towards a painful future and My poor children will cry and lament. The true doctrine will be despised and many will walk as blind to guide other blind people. There will be great confusion in the House of God. I am your Sorrowful Mother and I suffer for what comes for you. Do not turn away from prayer. Only by the strength of prayer can you bear the weight of the trials that will come. Give me your hands and I will lead you to My Son Jesus. Do not fear. Stand firm in the way I have pointed out to you and you will have heaven as a reward. Go Forward. I will always be with you. Open your hearts and accept the Will of God for your lives. Seek Jesus through His Word and in the Eucharist. Whoever is with the Lord will never experience the weight of defeat. This is the message that I transmit to you today in the name of the Most Holy Trinity. Thank you for permitting me to reunite you here once more. I bless you, in the name of the Father, of the Son and the Holy Spirit. Amen. Stay in peace. Dear children, go forward in the defense of the truth. You live in the time of great tribulations and the time has come for your sincere and courageous testimony. Do not forget: You are the Lord’s and only Him you must follow and serve. The day will come when many truths of faith will be despised and that which is false will be embraced. I ask you to keep the flame of your faith burning. Whatever happens, stay with Jesus and defend His Gospel. I know each of you by name and I will pray to My Jesus for you. Do not cross your arms. What you have to do, do not leave for tomorrow. In these times of spiritual tribulations seek strength in prayer and in the Eucharist. Let the Light of the Lord enlighten you. Be docile and everything will end well for you. Courage. When everything seems lost to you, the victory of God will happen for the righteous. This is the message that I transmit to you today in the name of the Most Holy Trinity. Thank you for permitting me to reunite you here once more. I bless you, in the name of the Father, of the Son and the Holy Spirit. Amen. Stay in peace. Dear children, I am your Mother and I love you. Stand firm on the path that I have pointed out to you throughout these years. Bend your knees in prayer, for only then can you bear the weight of the trials that will come. The Great Plan of perverse men will reach the priesthood. Many will be confused and few will remain firm in the faith. The Eucharist is the greatest treasure of the Church of My Jesus, because in it is truly My Son Jesus in Body, Blood, Soul and Divinity. This is a nonnegotiable truth. Stay tuned. Whatever happens, stay with the truth. Take care of your spiritual life and do not allow the things of the world to separate you from the Lord. Courage. You are the Lord's and you must follow and serve Him alone. Do not forget: Everything in this life passes away, but the Grace of God in you will be Eternal. Faith must always be your great treasure in this life. Only by faith will you arrive Heaven. Go ahead in the truth. This is the message that I transmit to you today in the name of the Most Holy Trinity. Thank you for permitting me to reunite you here once more. I bless you, in the name of the Father, of the Son and the Holy Spirit. Amen. Stay in peace. Dear children, I am your Sorrowful Mother and I suffer for what comes for you. Bend your knees in prayer. Your cross will be heavy, but My Jesus will not abandon you. In many places My poor children will walk like beggars, looking for the precious food and will not find it. Wishing to hear the truth, but they will not hear it. This will be a time of great pain for the faithful. I came from Heaven to announce to you what will come. Stay tuned. Believe firmly in the Gospel and be faithful to the True Magisterium of the Church of My Jesus. Do not be discouraged. Love and defend the truth. Do not fear. Testify that you belong to the Lord and do not allow anything to take you away from the truth. Go forward without fear. This is the message that I transmit to you today in the name of the Most Holy Trinity. Thank you for permitting me to reunite you here once more. I bless you, in the name of the Father, of the Son and the Holy Spirit. Amen. Stay in peace. Dear children, only My Son Jesus is your only and true Savior. Perverse men will say: Salvation may come through others, who are faithful to their ideologies. I am your Sorrowful Mother. I suffer for what is coming for you. The great spiritual confusion will spread everywhere. Stay with the truth. Do not turn away from Jesus. Believe fully in His Gospel. Only Jesus has Words of Eternal Life. Listen to him Seek it in the Eucharist and live turned towards the Paradise for which you were only created. Do not cross your arms. Do not live far from prayer. When you are separated, you become the target of the enemy of God. Give me your hands. I want to lead you on the path of good and holiness. Go forward in the defense of the truth. This is the message that I transmit to you today in the name of the Most Holy Trinity. Thank you for permitting me to reunite you here once more. I bless you, in the name of the Father, of the Son and the Holy Spirit. Amen. Stay in peace. Dear children, I am your Sorrowful Mother and I suffer for what is coming for you. You are heading towards a future of great trials. The Church of My Jesus will be small and its faithful will be persecuted. The enemies will invade the Catholic temples and expel the faithful. This will be the time of great pain for My poor children. I ask you to keep the flame of your faith burning. Do not retreat. Your reward will come from the Lord. In the midst of the great confusion, God will bring forth men and women of courage who will defend the truth and together with the faithful Ministers will give testimony of the Church of My Jesus. Bend your knees in prayer. You are not alone. I love you and I am by your side. I ask you to be faithful to Jesus. Do not be deceived by false doctrines. My Son Jesus is the Absolute Truth of the Father and only in Him can you find Salvation. Courage. I will pray to My Jesus for you. Whatever happens, stay in the defense of the truth. Go forward without fear. This is the message that I transmit to you today in the name of the Most Holy Trinity. Thank you for permitting me to reunite you here once more. I bless you, in the name of the Father, of the Son and the Holy Spirit. Amen. Stay in peace. Dear children, bend your knees in prayer. From the Palace vengeance will come and the just will carry a heavy cross. I suffer because of what is coming for you. Be filled with courage. Love the truth and defend it. Seek in the Words of my Jesus the strength necessary for your journey. In the Eucharist is your sustenance and the assurance of your victory. I came from Heaven to lead you to Heaven. Do not remain stationary in sin. Convert. Much depends upon your conversion. I know your needs and I will plead with my Jesus for you. Go forward in truth. Whatever happens, do not forget the lessons of the past. Be faithful to the True Magisterium of the Church. After Calvary will come the Victory of the Church. Have trust and hope in Jesus, for He is your only Way, Truth and Life. This is the message which I transmit you today in the name of the Most Holy Trinity. Thank you for allowing me to reunite you here once again. I bless you in the name of the Father, the Son and the Holy Spirit. Amen. Stay in Peace. Dear children, I am the Mother of Jesus and your Mother. I ask you to be faithful and try to witness to your faith everywhere. You are in the world, but you are not of the world. You are moving toward a future of sorrow. The times which I predicted have arrived. This is the time of the Great Battle between good and evil. I offer you as a weapon of defense the Holy Rosary and the Sacred Scripture, the Teachings of the True Magisterium of the Church, and my messages. Do not be afraid. The devil will cause ever increasing confusion, but the Victory will belong to my Son Jesus. Bend your knees in prayer. Take care of your spiritual life. Leave off the things of the world and serve the Lord with joy. I know your needs and I will plead with my Jesus for you. Have trust, faith and hope. The Definitive Triumph of my Immaculate Heart will bring peace to the world and men and women of faith will experience great joy. Go forward. This is the message which I transmit you today in the name of the Most Holy Trinity. Thank you for allowing me to reunite you here once again. I bless you in the name of the Father, the Son and the Holy Spirit. Amen. Stay in Peace. Dear children, witness by your very lives that you belong to the Lord. Say no to the darkness and turn toward the Light of the Lord. Do not live as pagans, but be truly the Lord’s. You live in a time in which many appear to be good and just, but inside they are evil men. Woe betide those who pretend holiness to fool my poor children. The day is coming when your souls will be in darkness. Accept my Appeals and live by the teachings of the True Magisterium of the Church of my Jesus. Do not allow false doctrines to make you stray from the Way to Salvation. Be alert to avoid being fooled. Do not forget: the Just Judge will call you to account. Turn to Jesus and you will be saved. You are moving toward a time of great spiritual confusion. It will be a time of war between good and evil. There will be great spiritual damage, but in the end the Lord will be victorious. This is the message which I transmit you today in the name of the Most Holy Trinity. Thank you for allowing me to reunite you here once again. I bless you in the name of the Father, the Son and the Holy Spirit. Amen. Stay in Peace. Dear children, I am your Mother and I love you. I invite you to sincere conversion and to live with joy the Gospel of my Son Jesus. Approach the confessional and seek the Mercy of my Jesus for your lives. Do not live in sin. You belong to the Lord and He is the only One you should follow and serve. In your hands the Holy Rosary and the Sacred Scripture; in your hearts, love of the truth. You live in a time worse that the time of the great flood. Return. My Lord awaits you with open arms. Be filled with the love of my Son Jesus, for only thus can you love and forgive your neighbor. I am your Sorrowful Mother and I suffer because of what is coming for you. Do not stray from the Lord. When you are apart from Him, you become a target of the enemy. My Jesus is very near to you. Trust in Him who knows each one of you by name and knows what your needs are. Do not allow the flame of faith within you to be extinguished. Humanity is walking about spiritually blind, and many of my poor children need you. Give me your hands and I will lead you by the safe path. Do not retreat. Tomorrow will be better for men and women of faith. Repent, for repentance is the first step to be taken on the road to holiness. When everything seems lost, my devotees will be blessed with a great victory. Go forward with joy. This is the message which I transmit you today in the name of the Most Holy Trinity. Thank you for allowing me to reunite you here once again. I bless you in the name of the Father, the Son and the Holy Spirit. Amen. Stay in Peace. Dear children, courage. I invite you to live in the truth. Do not fear persecution. My Son Jesus was persecuted, but He never quit proclaiming the truth. Humanity lives in a sad spiritual blindness and my poor children walk about in doubt and uncertainty. The Church, assuming the Mission entrusted to it by my Son Jesus, should proclaim the truth and defend it. In the teachings of Jesus there are no half-truths. Whenever there is half-truth, the Presence of Jesus is not in that place. Bend your knees in prayer. Now is a time of suffering for men and women of faith. Do not retreat. Seek strength in the Eucharist and in the Words of my Jesus. Humanity will only find true conversion and freedom by accepting Truth in all its fullness. I am your Mother and I came from Heaven to take you to Heaven. Listen to me. Go forward. After all the sorrow, the Lord will dry your tears and you will see Peace reign upon the Earth. Those who remain faithful until the end will see the Splendor of the Lord. This is the message which I transmit you today in the name of the Most Holy Trinity. Thank you for allowing me to reunite you here once again. I bless you in the name of the Father, the Son and the Holy Spirit. Amen. Stay in Peace. Dear children, I am your Immaculate Mother and I came from Heaven to call you to conversion. Be meek and humble of heart, for I wish to lead you to my Son Jesus. I ask you to keep yourselves free from sin, for you are precious in the Eyes of the Lord. You are created in His image and likeness and you must not become slaves to sin. Do not forget: Everything in this life passes, but the Grace of the Lord within you will be eternal. Free yourselves completely from all evil and serve the Lord with joy. Humanity lives in the darkness of sin, but I came from Heaven to lead you to the Light of the Lord. The devil has released his poison everywhere, causing spiritual blindness of my poor children. Return to Jesus. Humanity will drink of the bitter chalice of pain because men have strayed from the Creator. Return quickly. Pray. Pray. Pray. You will yet see horrors upon the Earth. The enemies of God will act with great fury against the Chosen ones of the Lord, but do not retreat. Your reward is already prepared by the Lord. Go forward with courage. Love the truth and defend it. This is the message which I transmit you today in the name of the Most Holy Trinity. Thank you for allowing me to reunite you here once again. I bless you in the name of the Father, the Son and the Holy Spirit. Amen. Stay in Peace. Dear children, bend your knees in prayer. Traitors will bring about suffering to the faithful. Great spiritual confusion will spread everywhere and the just will carry a heavy cross. Days are coming when in the House of God there will be few virtuous men and women. The lack of order will cause division among the consecrated and the cross will be heavy for the Lord’s Elect. I suffer because of what is coming for you. Do not retreat. Do not be discouraged. Whoever is with the Lord will never experience defeat. Love the truth and defend it. Accept the Gospel of my Jesus and strengthen yourselves with His Divine Presence in the Eucharist. Listen to Jesus. He wants to speak to you. In silent prayer listen for the Voice of my Jesus and let Him lead you. Go forward without fear. This is the message which I transmit you today in the name of the Most Holy Trinity. Thank you for allowing me to reunite you here once again. I bless you in the name of the Father, the Son and the Holy Spirit. Amen. Stay in Peace. Dear children, courage. Do not retreat. The road to holiness is full of obstacles, but those who remain faithful will achieve great joy. You are moving toward a difficult time and there will be great confusion everywhere. I suffer because of your suffering, but woe betide the ones who cause confusion in the House of God. Woe betide those who deny the Truth of my Jesus. I ask you to be men and women of faith. Do not allow the lies to win. You are the Lord’s. Do not be discouraged. I am your Sorrowful Mother and I will always be at your side. Seek strength in the Words of my Jesus and in the Eucharist. Listen to the True Magisterium of the Church. Stay with Jesus. In the Great War between the True Church and the false one, the final victory will belong to Jesus and His Elect. I know each one of you by name and I will plead with my Jesus for you. Go forward, always in the truth. This is the message which I transmit you today in the name of the Most Holy Trinity. Thank you for allowing me to reunite you here once again. I bless you in the name of the Father, the Son and the Holy Spirit. Amen. Stay in Peace. Dear children, I am your Mother, who repeats the same song: Return to my Son Jesus. He is your Only and True Savior. Trust in Him who sees what is hidden and who knows you by name. You are the Lord’s and He is the only one you should follow and serve. You are moving toward a Great Spiritual Catastrophe. Many of those chosen to defend the truth will turn away in fear. Bend your knees in prayer. Now is a time of sorrow for men and women of faith. I came from Heaven to help you. Be docile. Give the best of yourselves, and the Lord will repay you generously. Do not be afraid. When everything seems lost, the victory of God will come for His Elect. Love the truth and defend it. Do not allow the devil to win. Seek strength in the Words of my Jesus and in the Eucharist. Your strength is in Jesus. Do not stray from Him who is your Absolute Good and who knows you by name. Go forward. This is the message which I transmit you today in the name of the Most Holy Trinity. Thank you for allowing me to reunite you here once again. I bless you in the name of the Father, the Son and the Holy Spirit. Amen. Stay in Peace. Dear children, open your hearts to the love of my Son Jesus. He is your all and in Him alone can you find strength for your journey. Be filled with hope and live the Gospel of my Son Jesus with joy. In this opportune time of grace, prepare for Christmas. Take steps toward holiness and my Son Jesus will bless you. Do not be preoccupied with material things. Value the Treasures which the Lord offers you. Be quiet and listen to the voice of my Son Jesus. Let Him become of Greatest Importance in your lives. Sorrowful times will come, but do not be discouraged. As promised, my son Jesus will always be with you. There is no victory without the cross. When all tribulations are past, you will see the Victory of God. Be faithful and never stray from the truth. Those who belong to the Lord will experience His Marvels. Go forward without fear. This is the message which I transmit you today in the name of the Most Holy Trinity. Thank you for allowing me to reunite you here once again. I bless you in the name of the Father, the Son and the Holy Spirit. Amen. Stay in Peace. Dear children, I am your Sorrowful Mother and I suffer because of what is coming for you. Now is a time of the cross for men and women of faith. Bend your knees in prayer. You live in the time of the Great Spiritual Battle. Seek strength in faithfulness to the Gospel and in the True Magisterium of the Church. Do not be afraid. I am at your side, even though you do not see me. Courage. Whoever is with the Lord will never be defeated. From the Palace will come news that will shake the faith of the faithful, but do not retreat. The Answer of the Lord will come. Do not be discouraged. Be filled with hope and all will end well for you. Go forward without fear. This is the message which I transmit you today in the name of the Most Holy Trinity. Thank you for allowing me to reunite you here once again. I bless you in the name of the Father, the Son and the Holy Spirit. Amen. Stay in Peace. Dear children, I came from heaven to lead you to the safe harbor of faith. Open your hearts and be led by Jesus. Have trust, faith and hope. Tomorrow will be better for men and women of faith. Tell everyone the God is in a hurry and that they must not live with their arms crossed [in idleness]. Do not hold back. In your hands the Holy Rosary and the Sacred Scripture; in your hearts love of the Truth. I ask you to be instruments of peace to all those who have lost peace. Humanity lives apart from the Lord and my poor children walk about as blind people leading other blind people. Leave off sin and return to the Lord. I do not want to obligate you, but what I say should be taken seriously. Seek strength in my Son Jesus. Feed yourselves on the precious food of the Eucharist, for that is the only way you will grow spiritually. Do not be discouraged. I am always near to you. After all the tribulation, the Lord will dry your tears and you will see the Definitive Triumph of My Immaculate Heart. I know your needs and I will plead with my Jesus for you. When you feel the weight of the cross, call upon Jesus. He is your Great Friend and He will not abandon you. Go forward in joy. This is the message which I transmit you today in the name of the Most Holy Trinity. Thank you for allowing me to reunite you here once again. I bless you in the name of the Father, the Son and the Holy Spirit. Amen. Stay in Peace. Dear children, do not be afraid. The enemy of God acts, but the victory will be the Lord’s. Be defenders of the truth. Return to Jesus. Do not hold back. He loves you and awaits you with open arms. You live in the time of a Great Spiritual Battle. The Rosary is your weapon of defense and the Eucharist is your sustenance. The Words of my Jesus are the Light upon your path. Give me your hands and I will lead you to the One who is your Way, Truth and Life. You belong to the Lord and He is the only one you should follow and serve. Do not forget: You are in the world but you are not of the world. Flee sin and live turned toward Paradise, for which alone you were created. Humanity has strayed from the Creator because men strayed from the truth. Now is the time for your return. Courage. I love you and I am with you. Give the best of yourselves to the mission which has been entrusted to you. Do not allow your free will to lead you astray from the Lord. You are free to belong to the Lord. My Son Jesus is your All and in Him alone is your true freedom and salvation. Remember always: In God there are no half-truths. A great war will occur and the soldiers will be wearing priestly garb. I suffer because of what is coming for you. Pray. Pray. Pray. This is the message which I transmit you today in the name of the Most Holy Trinity. Thank you for allowing me to reunite you here once again. I bless you in the name of the Father, the Son and the Holy Spirit. Amen. Stay in Peace. Dear children, those who love the truth and defend it will experience a heavy cross. Do not remain silent. Your silence strengthens the enemy of God. Have courage. My Son Jesus is very near to you. Give Him your very existence and become great in the faith. I am your Mother and I love you. Listen to me. God is in a hurry and you can not live stationary in sin. Repent and serve the Lord with faithfulness. Seek strength in the words of my Jesus and in the Eucharist. Do not be discouraged. This is the message which I transmit you today in the name of the Most Holy Trinity. Thank you for allowing me to reunite you here once again. I bless you in the name of the Father, the Son and the Holy Spirit. Amen. Stay in Peace.